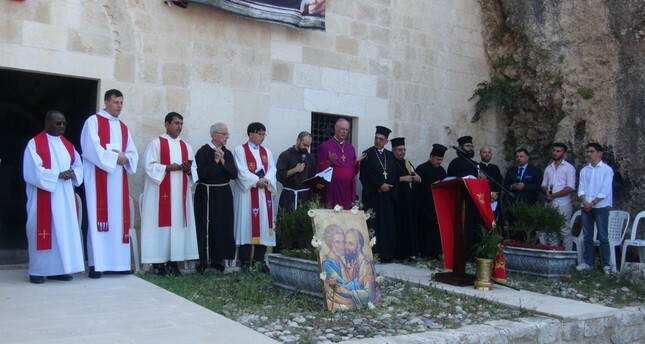 Catholic and Orthodox clergy came together to mark the day at the historic Antakya church. Converging at a historic church in the southern Turkish city of Hatay, the Catholic and Orthodox community conveyed messages of peace at a religious service held on the occasion of the Feast of Saints Peter and Paul. The liturgy on Friday was observed at the world's first "cave church," St. Pierre also known as St. Peter, or rather, in front of the exotic place carved into the rocks. Against the backdrop of the church's facade adorned with Turkish flags and a poster of Mustafa Kemal Atatürk, founder of the Turkish Republic, the faithful prayed and recited passages from the Bible while the choirs sang hymns. Paolo Bizzeti, Apostolic Vicar of Anatolia who heads the Catholic Church's jurisdiction in the region, joined leaders of the Antakya Orthodox Patriarchate based in Hatay. Dimitri Doğum, spiritual leader of Antakya Orthodox Church, told reporters that the church where they held the religious service was one of the first places Christianity spread to from the world. "This is a place where adherents of this faith were first named Christian. So, it is a special occasion for us to send a message of love from here. All religions are based on peace and love and we need to understand what is written on peace and love in the holy books. We pray to God to live under the Turkish flag, in this beautiful country for longer and for peace and prosperity to prevail in the world." The church, which has a common name like hundreds of Christian churches in the world, is actually believed to be the first Christian church built by the said disciple of Jesus Christ. The name "Christian" was also first used during a meeting of the congregation here, according to popular belief. St. Peter himself preached Christianity in Antioch where modern-day Hatay is located. It was not preserved in the original state but the Christian community kept the hillside cave church mostly intact with multiple restorations. It was declared a pilgrimage site in 1963 by Pope Paul VI.